Michael is originally from Fort Lauderdale, Florida and began his musical studies on Tuba in 6th grade. He began playing for Honor Band’s in his District and County in 7th Grade and never scored less than 1st Chair. This also lasted through High School as 1st chair in all Honor Bands. In 1990, he auditioned for the United States Marine Corps Bands and was the first musician selected in South Florida in 15 years. He completed Basic Training and then graduated from the Armed Forces School of Music in 1991. He has served with the MCAGCC Band in Twenty-nine Palms, CA, Marine Band San Diego, and two tours with the III MEF Band in Okinawa, Japan. During his time in the Marine Corps he served as Platoon Sergeant, Small Ensemble Leader, Drum Major and Enlisted Conductor. He led Bands for Presidents. Heads of State, and Foreign Dignitaries across the US. He has performed in Russia, Korea, Japan, China and all across the Pacific Theater. After leaving the USMC, Michael began his studies to fulfill his dream of being a High School Band Director. He graduated from Casper College in Wyoming with is Associates Degree in Music Education and his Bachelor’s Degree from North Dakota State University in Fargo. During that time, he served as Principal Tuba with the Billings Symphony Orchestra, performed with the Fargo-Moorhead Symphony, and Bozeman Symphony. He began his teaching career at Orland High School teaching Band, Choir and Musical Theater, and then took a Leave of Absence to teach at Barrow High School in Barrow, Alaska (300 miles north of the Arctic Circle). He returned to Orland High and taught there for one more year. 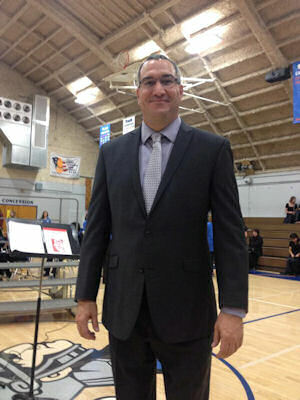 Most recently, Michael has taken the position of Band Director of the Las Plumas/Oroville High school program. He performs with the Paradise Symphony and works as a tuba player with the Brass Connection Quintet in Chico. He recently performed in the Musical "Mamma Mia" with the Chico Theater Company He is also a founding member of the Band of America's Few. Michael began his directorship with the Oroville Community Concert Band in March of 2019. He is married to his wonderful wife Nicole, and has two children Peter and Ariel. April's family has lived in Oroville for six generations, and she currently lives on the property that was homesteaded by her ancestors in 1876. April has actively participated in music at home, church and school her whole life. She sang her first solo at age 5 at Poplar Elementary and continued to sing, play the piano and clarinet all through her elementary and high school years. April graduated from University of the Pacific with a Bachelor of Music, BM, in music therapy, Music Therapist-Board Certified, MT-BC. 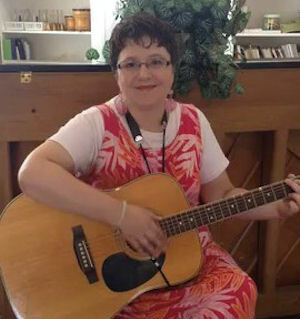 She moved to Oregon and Texas and worked as a music therapist both in hospitals and in private practice. April also taught music at Kings Valley Charter School, directing and writing two musical productions a year. From 1996-2015 April directed 13 different choirs and sang in many choirs herself, including the MasterSingers with the San Antonio Symphony. April currently teaches private music lessons, voice, piano and ukulele and was appointed the Oroville Community Chorus director as of September, 2018.